Welcome to The Jambo Registry! The Jambo Registry (Est. 2006) is dedicated to the preservation and restoration of the 1982 Jeep CJ-7 Jamboree Commemorative Edition (The Jambo), the rarest CJ-7 ever produced and one of the rarest Jeeps of all time. This site is a companion to The Silver Registry, which tracks all known examples of the 1979 CJ-5 Silver Anniversary (The Silver). Here, you will find an overview of the Jambo, details on its special features, and the Jambo Registry TM, which lists all the known Jambos. To receive an email about additions to this site email jambo152@82jambo.com. We estimate that about 630 Jambos were produced. This makes the Jambo one of the rarest Jeeps ever produced. It is as rare at the 1971 Renegade II, of which 600 are believed to have been producd. Here you will learn about the rare Topaz Gold Metallic Jambo (560 produced, ~160 remain), the elusive Olympic White Jambo (70 produced, ~20 remain), and the unicorn, one of the rarest Jeeps ever made, the Olympic White Jambo with a factory TorqueFlite 999 automatic transmission (11 produced, only 4 known to exist). If you want a super cool, collectible Jeep, the Jambo is it! In 2018 Hagerty named the CJ-7 as one the "9 Hottest Collectible Cars" and singled out the Jamboree! You can read the article here. Four Wheeler Magazine is currently featuring the Jambo! You can read the article here. Check out our new Jambo artwork! We have prints, mugs, and t-shirts. To visit our store click here! Do you need Jambo Parts? Click here to see our inventory. - Jambo artwork! Click here! We commissioned some Jambo artwork, based on the Jambo #2000 stock photo. Low resolution examples are below. These images were created by shivam.carboy, who draws these on his phone using only his fingers. Amazing work! We created Topaz Gold and Olympic White versions! This is what an Olympic White stock-photo Jambo would have looked like--no such photo is known to exist. Each piece denotes the number of Jambos produced: 1/560 Topaz and 1/70 White. You can buy prints in various sizes, t-shirts, or a coffee mug that features both the Topaz and the Olympic White Jambos. To visit our print store click here: Jambo Registry Print Store. Please note: These images are copywritten by The Jambo Registry and may not be copied. Source: Peterson's 4-Wheel & Off-Road, Nov. 1982. Here is the 1982 Jambo sales brochure! The Jambo was a 1982 1/2 model-year CJ. Production began in March 1982 and ended with the 1982 model year in June. In today's dollars, a fully-equipped Jambo cost an additional $13,000. That is similar to what a Rubicon package costs today. Jeep produced the Jambo in 1982 to honor the 30th Anniversary of the Jeepers Jamboree. The Jeepers Jamboree started in 1953 and takes place on the Rubicon Trail (The Devil's Playground). The Jeepers Jamboree is the granddaddy of all off-road events and Jeep wanted to honor it by naming a Jeep vehicle "Jamboree," much like they now produce the Rubicon. Shown to the left is one of several Jambos that were driven on the Rubicon during the 30th Anniversary event. A factory-equipped Jambo cost about $3,500 more than a base CJ-7. And, that did not include the Accessory Jamboree Package (winch, brush guard, etc.). The base CJ-7 sold for $7,765. So, the Jambo sold for about a 45% premium to the base CJ-7. A Jambo cost more than 2-door Cherokee. The Accessory Jamboree Package added another $1,644 to the price. So, a fully-decked out Jambo, like you see in the factory photos, cost an about an additional $5,200. That was a 67% premium to the base model. Jeep produced about 630 Jambos. This limited production run makes the Jambo not only the rarest CJ-7, but one of the rarest Jeeps ever produced. The Jambo was only produced in 1982. The only other AMC single-model single-year Jeep is the 1979 CJ-5 Silver Anniversary (The Silver). The Golden Hawk was only produced in 1980, but it was a trim package that was applied to CJ-5s, CJ-7s, and even the Cherokee. The pre-AMC 1971 Renegade II is also quite rare, with 600 copies having been made, in four colors. Each Jambo was numbered by a special commemorative plaque, or badge, on the dash denoting its production number. This is the only AMC Jeep to have ever been specially numbered. In addition, the Jambos carry a special trim code of 1EN on their firewall VIN tag. This numbering is very important because helps to confirm the authenticity of Jambos and makes them more difficult to fake. You can't fake a Jambo by slapping on some decals. The Jambo is even harder to fake than a '79 Silver Anniversary because the Silvers were not numbered, though they do carry a special code on their VIN tag. Jambo's numbered dash plaque can be related to the VIN. Thus, not all numbers make sense and this can be clearly seen. In this sense, the Jambo is like the Scrambler in that its authenticity is much easier to ascertain than other Jeeps. 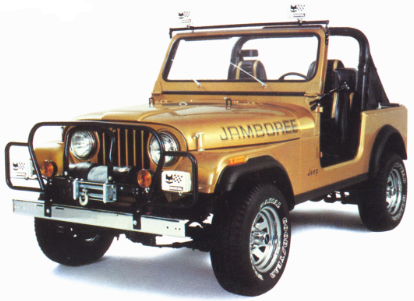 All Jambos were, originally, supposed to be Topaz Gold Metallic and this was the only Jeep vehicle, other than the Wagoneer that could be painted gold in 1982. In fact, the Jambo is the only CJ that was ever painted Topaz Gold Metallic. This coloring adds another feature that makes it easier to identify true Jambos. Later, Jeep added Olympic White as a option. Olympic White was a very common color, used from 1979-1986 (Alpine White was used before that). AMC planned to produce only 2500 Jamborees. However, the economy was recession in 1982 and Jeep sales were down 50% from prior years. Out of nearly 120 confirmed Jambos in our registry, none is numbered over 751, despite over 11 years of searching. The research undertaken by The Jambo Registry reveals that about 630 Jambos were produced (some numbers were skipped) and fewer than 200 are still in existence. Of these, perhaps fewer than 50 are in original or restored condition. Sure the Laredo, Renegade, and Golden Eagle are cool, but these were very common packages applied to many different vehicles, not just CJs. The Scrambler (CJ-8)? Yes, the Scrambler is a very cool, low production, Jeep CJ. However, for every Jambo produced nearly 50 Scramblers were made! In terms of low production numbers, only the '71 CJ-5 Renegade II and the '79 CJ-5 Silver Anniversary compare and they were not numbered. The 1973/1976 Super Jeep is more rare, but you have almost no chance of ever finding one. You can find a Jambo if you look carefully and act quickly! If your looking for a super cool collectible Jeep CJ, the Jambo is it. It is without a doubt the rarest CJ-7 ever built. And, as you will learn here, it has a history that no other CJ-5/CJ-7 can match! Note: The color in this photo is a bit deceiving. It was likely taken indoors with mutiple bright light sources. This effect cannot reproduced outside with our single light source: the Sun. On the exterior, all Jambos came standard with Topaz Gold Metallic paint, Jamboree hood lettering, chrome wheels, chrome bumpers/bumperettes, black soft top, black rocker trim (not chrome or bright aluminum), and special Jamboree spare tire cover. Late in the production run Jeep made a few (only about 70) Olympic White Jambos. On the interior, Jambos had special black bucket seats with gold inserts (front and rear) to match the Topaz Gold Metallic paint, center console, black floor and wheelhouse carpeting, black padded roll bar, saddle bags, and special plaque denoting the production number mounted on the instrument pannel. Together, all of the content was known as the "Factory Jamboree Package." Jambos also came standard with the 258 CID 6-cylinder engine (upgraded from the 4-cyl; the V8 was no longer available), 5-speed manual transmission, power steering, power disc brakes, 20-gal fuel tank, tachometer, rally clock, Marchal 850 fog lamps, tilt steering, heavy-duty battery, heavy-duty alternator, heavy-duty cooling, heavy-duty suspension, and a Trac-Loc differential. The Ramsey winch, brush/grille guard, light bar, and AM/FM/CB radio were dealer-installed options. This was known as the "Accessory Jamboree Package." We estimate that fewer than 5% of Jambos (about 30) came with this package. Originally all Jambos were supposed to be Topaz Gold Metallic, but about two-thirds of the way through the production run Jeep decided to offer the Jambo in Olympic White as well. Only Jambos could be ordered in Topaz Gold. The only other 1982 Jeep vehicle that could be Topaz Gold was the Wagoneer (see the 1982 Sales Brochure). Any CJ could be ordered in Olympic White. The fact that Jambos have at least six unique characteristics: trim code, dash plaque, VIN-plaque number relationship, Jamboree decals that did not appear on any other Jeep (unlike Renegade), unique seats, and unique color, increases their attractiveness to Jeep collectors. For more detail on the Jambo's features click here. No known factory list of Jambo VIN numbers exits. The Jambo Registry has talked to Chrysler and they say that all Jeep records were thrown out when they acquired AMC. This makes it more difficult to verify a Jambo. However, after 11 years of research The Jambo Registry has compiled a list of over 200 Jamborees, with pictures. Further, we have the VIN numbers for nearly 70% of the Jambos on the site. Do not buy a Jambo unless it has been registered with The Jambo Registry and its VIN verified! Jambos can be faked by buying badges off eBay or pulling them off salvaged Jambos. Click here for the Jambo RegistryTM. The Jambo is featured in the following books. Jeepers Jamboree: The First 30 Years by Peg Presba. This book covers the first 30 years of the event that gave birth to the Jambo. It includes special coverage of the 30th anniversary event and the Jambo. It includes several Jambo photos, incluing a color photo of the Jambo given away during the event! We have this book for sale! Jeep Collectors Library by Jim Allen. Features a Jambo on the front cover! Jim gives the Jambo 4 stars out of 5 for investment potential, only the 1970-1975 Renegade and the 1973, 1976-1977 Super Jeep (only two known to exist) are rated higher. Jim writes "Only 2,500 numbered copies were built, and this is one later Jeep that will bring a few bucks." Note: We have since learned that the 2500 production estimate was too high by about a factor of four. We have this book for sale! Jeep CJ: 1945-1986 by Robert Ackerson (pp. 190-195). Includes lots of color pictures, which are taken from the Jambo sales brochure. Standard Catalog of Jeep: 1940-2003 by Patrick Foster (p. 149). Jeep: The History of America's Greatest Vehicle by Patrick Foster (p. 119). Jeep Color History by Steve Statham. This includes a full page color photo (p. 108). “Tribute to Two Legends,” Four Wheeler, June 1982, p. 45. This one-page article features the upcoming CJ-7 Jamboree. It has two pictures. Color versions were be great because these are the only “staged” photos of a Jambo outside of the factory that we are aware of. It also looks like it might be a different Jambo than they used in the brochure. “High Society,” Four Wheeler, Nov 1982, pp. 48-51. Covers the 30th Anniversary Jeepers Jamboree. Gives the names of the people who each won a new Jambo. Has a picture (top of page 51) of a Jambo on the Rubicon. The bottom of page 51 has picture of the 65 CJ-7s Jeep sent for its employees and dealers to drive. "A Capital Idea,” Four Wheeler, Dec 1982, p. 15. The small insert shows Congressmen Gene Chappie (R-CA) standing in front of the US Capitol with his Jamboree. “Jambing at 30,” ,” 4-Wheel & Off-Road, July 1982, p. 100. A small insert about the upcoming release of the Jambo. “30th Annual Jeepers Jamboree,” 4-Wheel & Off-Road, Nov 1982, pp. 54-59. Covers the 30th Anniversary Jeepers Jamboree. Though the text does not cover the Jambo in as much detail as the Four Wheeler article, this article has many more Jambo pictures! The first one is on page 54. It is a COLOR version of a Jambo on the trail. This is the earliest known photo of a Jambo outside the factory. Page 56 has two more photos of this Jambo as do pages 58-59. But, here is the kicker: pp 58-59 include a photo of the CJ-7s sent by Jeep (they report 70, instead of 65). You can clearly see three gold Jambos in the foreground of this photo. So, we know that at least three were there. We have this magazine for sale! Click here for answers to some tough Jambo questions. Please see our Documents page for lots of general CJ information. Click here for a copy of the original Jambo sales brochure. This details the Jambo's standard features and includes great color pictures. Here are the Product Direction Letters that defined the Jambo (thank you to Jim Allen for providing these! ): PDL1, PDL2a, PDL2b. Here are copies of the letters sent to dealers regarding the Jambo: Jambo Annoucement and Jambo Revision. Here is a copy of the original Jambo advertisement. This also appears in Jim Allen's book. AMC had a sweepstakes in 1982 with a new Jamboree as first prize. Here is the flyer. Diana Falcone, of Midland, Texas, won the sweepstakes and drove her prize on the Rubicon during the 1982 Jeepers Jamboree. Check out the certificate of authenticity that came with each Jambo. Here is a copy of the letter provided to owners. Click here for the original paint colors (2H = Jambo, 9B = possible Jambo). Click here for the 1982 trim codes (1EN = Jambo).